In terms of building online buzz, fast-food marketers have tried some seriously strange tactics in recent years. While challenged by slumping sales and increasingly competitive fast-casual restaurants, fast-food brands lead the pack in terms of one-off marketing and PR campaigns that target millennials. Here are are five of the weirdest digital exploits that marketers have used to get people talking. When Ogilvy & Mather wanted to connect the dots between Pizza Hut and movies, it turned boxes into film projectors. A detachable lens in the middle of each pizza pops into a perforated area of the box. People then use a smartphone to scan a QR code that links to a website that plays a movie. Propping up the phone on a makeshift stand inside the box then projects the movie on a wall or screen. Like all fast food chains these days, Burger King is trying to be hip with younger consumers. So, it built an emoji app to bring back chicken fries on its menu. Teens can send branded stickers of the deep-fried food to their friends. Would you do that? The snack brand employed 3D printers to make cookies at the South by Southwest Interactive festival in 2014. The activation in Austin, Texas, included physical vending machines that assembled cookies in real time as people tweeted about the brand. The tweets often determined the flavor of the cookie. Anyone hungry for a hashtag? 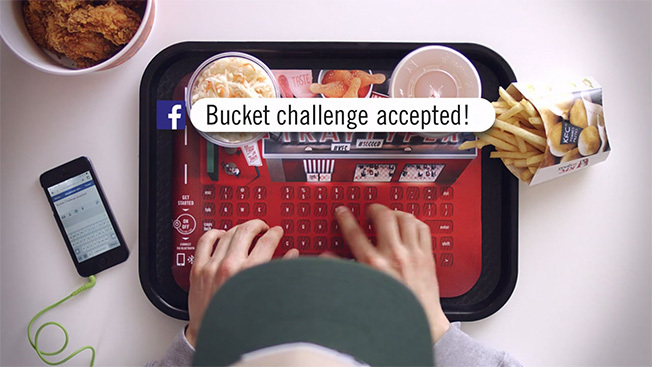 Playing off of the chicken chain's "Finger Lickin' Good" slogan, the fried chicken chain's "Tray Typer" campaign in Germany equipped restaurant trays with Bluetooth-enabled mats so that people could use their phones without touching them with greasy fingers. The mats had built-in Wi-Fi and were rechargeable. According to Serviceplan—the agency behind the campaign—social media chatter located around the restaurants grew, although it's not clear by how much. Online ordering is so 2014 for Domino's. Now all it takes is tweeting a few pizza emojis to order a pie. Earlier this year, the brand and Crispin Porter + Bogusky started tweeting like crazy to announce the new service, causing other brands like JCPenney to jump into the fun.